Most of our travel in Vietnam was arranged by our tour. We took the overnight train from Ninh Binh to Da Nang and it is a good way to travel, as long as you keep your expectations on the accommodations in check. We had upper bunks in a 4-bed soft sleeper cabin from Ninh Binh to Hoi An and this was the best night of sleep most of us had on the entire trip. Something about the white noise and motion of the train just rocked us to sleep. There are periodic announcements on the train, but each cabin has a volume switch so make sure to turn that off. There was also a speaker with a switch in the hallway. The beds were narrow and on the very firm side, but suitable. My husband is over 6 ft and had a little trouble with the length, but managed. The upper bunks had little nooks at the foot of the beds for luggage and our packs fit nicely. We felt safe having our things tucked away right next to us, but anything bigger than a small carry-on might be a challenge. The lower bunks had room for bags under the beds, but some of the larger suitcases didn’t fit and had to stay in the middle of the floor. The top bunks in our train did not have any power outlets (and of course when we got to our hotel the next day the power was out). Getting up and down from the top bunks wasn’t too bad, but did require a small amount of strength and coordination. Instead of a ladder, there were foldable foot pegs and a bar to boost yourself up and down. We were warned that the food on the train is very poor, so we stopped at the grocery store before going to the station and got a bunch of snacks, water, and cup soups. There are hot water machines in each train car but not all of them worked. One of the train conductors saw me struggling and kindly showed me to a working one and filled my cup for me. There is food available for purchase on the train and occasional carts that come around, as well as a selection of food in the shops at most of the train stations. Our guide warned us that some of the vendors have keys to open the cabin doors. We didn’t experience this, but don’t be surprised if you wake up to a tea lady standing in your cabin, kindly trying to sell you a hot beverage. The bathrooms were the scary part of the train. They were tiny, smelly, and disgusting. There was nothing to hold onto, so I can’t even blame people for making a mess with the train swaying and bouncing along. Make sure you bring toilet paper and soap, because there was a shortage of both. The part of the train I really enjoyed was the ability to see a bit more of the country. The train is fast enough to get you there in less than a day, but slow enough to see a lot. I couldn’t see out the window from the top bunk, but the corridors had large windows on one side and the side with the windows switched every couple trains. Many of the windows opened up big so you can get clear pictures and even stick your head out very very carefully. Some plants are close enough to actually touch side of the train and many poles and tunnel walls are only inches away. The coast and the mountains were wild and beautiful. The train went right through towns so you could often see right into people’s backyards. I saw several water buffalo running through a field and train attendants manually sliding railroad crossing gates back and forth across the roads to block cars while the train was passing. The Man in Seat 61 has a fantastic guide to the Vietnam rail system, with tons of information. We flew into Hanoi, from Da Nang to Ho Chi Minh City, and out of Ho Chi Minh City, so we saw all of the major airports. 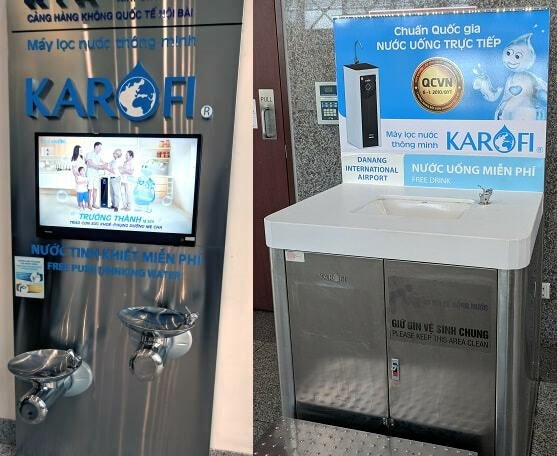 All of the airports had filtered water stations available for filling bottles and if you are flying domestic they don’t even make you dump your water out. You can keep it! The queues and security were all fairly standard and the people at the desks spoke English. For our flight home we showed up 3 hours early, but we weren’t allowed to check-in until 2 hours before the flight. This may vary by airline. All of the airport had a selection of overpriced souvenirs, sim cards, and food options. The international terminal of Ho Chi Minh City (Saigon) Airport had showers tucked away in a corner that were nice (just cold water, but very clean). The stalls were huge, but the entire floor gets wet, so you’ll want to leave your luggage with someone. SIM Cards - Check prices at a couple places. Usually the one closest to the door is the most expensive so don’t let them bully you. 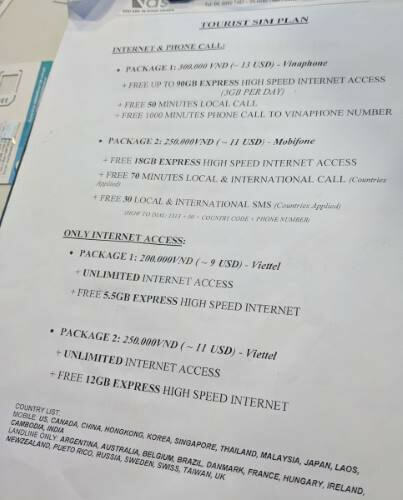 We picked one up in Hanoi at the doors right after baggage claim for $9 for data for 30 days. They popped it in my phone and it worked right away. Don’t forget to ask for a pin to get it back out again, if you don’t have one, so you can put yours back in on the way home. Too Many Adapters has a good article on the different options. We used Vittel and had service everywhere we went except out on the water. Food - Most of the food options in the international terminal of the airport in Ho Chi Minh City close at night but in their food court Big Bowl and Burger King were still open around midnight. Their menus were in USD but they took VND as well. It cost $2 for a soda, $3 for a coffee, $1.50 for a spring roll, and $1-10 for a bowl of pho. The soup was nothing special, but not bad and a decent portion. All of the buses we took were arranged by our tour. Some of the buses were a little cramped for tall and/or wide people, but were standard coach buses. Some had cargo space underneath for bags and on some we had to stack luggage in a precarious pile at the front of the bus. Most of the drivers did not speak English. Many of the buses had curtains, decorations, and pictures of Ho Chi Minh (Uncle Ho) in the front window. 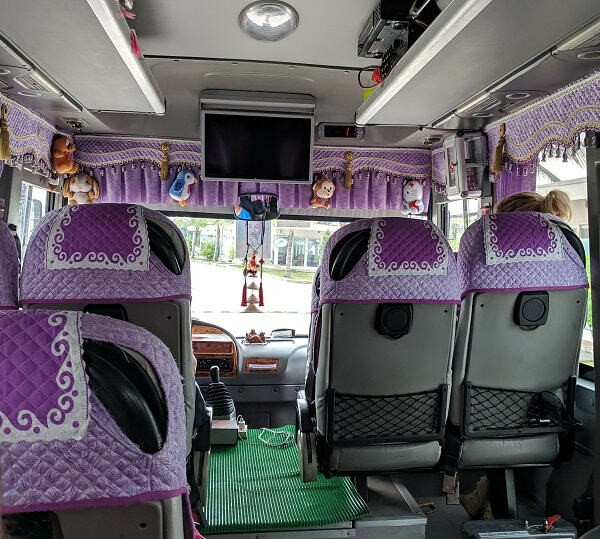 Due to the traffic, buses often take a long time to travel seemingly small distances, but this is a great way to see a bit more of the country. Our bus rides varied between 1 to 4.5 hours. Rest Stops - Most of the ones we stopped at were setup along the standard tourist routes as tourist traps. They weren’t horrible, but definitely on the pricey side, and most of them had you walk though their shop to get to the restrooms. All of the restrooms were functional, but some were quite dirty, and a couple had the option of open squat stalls or one stall with a door. One rest stop on the way to Ha Long Bay employed disabled people who were victims of agent orange and other maladies to do embroidery and stone work. Many of the workers were on display up front, and while it was an interesting place to walk around it makes you feel quite guilty. Grab (similar to Uber) - Uber does not work in Vietnam but they have a similar ride sharing system called Grab. This gives you the option of calling vehicles, just like Uber, or getting a motorbike taxi. The prices are very reasonable and it eliminates negotiating and the language barrier. Make sure you download the app before you go. You do need to have a data plan to use this. Taxis - We did not use any taxis, but if you are going to use them make sure you read up on how to know which ones are legit. There are many fake taxis out there, some that don’t run the meters, and many other scams. There are also many motorbike taxis and cyclos (rickshaw) in some areas. Both of these options can be less than a taxi, but sometimes the cyclos will actually charge more because of the touristic appeal of them. Car - I don’t recommend renting a car, as this is not the easiest country to drive in. A bicycle or motorbike (only if you are a confident rider) is a better option, or hire a driver for the day. I’m really not clear on what the laws were regarding life jackets. It seemed like for the most part you just had to have them with you if you were on a small boat, but every once in a while they would have us put them on (insurance perhaps). Boating was great fun, but don’t be surprised if the boats don’t look or feel especially solid. Most of the ones we were on looked a bit shaky, belched black smoke, and tipped to one side or the other. The boat shown below was so unsteady that the passengers had to be organized as they boarded to keep the boat from tipping. Overall, I enjoyed it and just felt that it was part of the adventure, but I think it is good to know what to expect. Taking a cruise ship from port to port along the coast is also an option for a way to travel this country. They are convenient, but I feel like they typically don’t give you a genuine experience and you miss a lot of the country by just seeing the major ports. This is a popular option that gives you a ton of flexibility and many bikes are available for rent by the day or week. People may put some crazy things (and numbers of people) on bikes, but no matter where you are in Vietnam, wearing a helmet is the law. A semi-popular option for long stay travelers is to purchase a scooter and sell it at the end of their trip. If you are interested make sure to do your research. There are plenty of blogs out there on doing this. If you are renting any kind of motorbike be sure you are a confident rider. It varies a lot by area, but after ten years of riding, there are some places in Vietnam that look like fun, but many others that I would not attempt. Traffic laws (and the lack of them) can be especially challenging, not all rural roads are paved, and they get some serious rain. I love the freedom and feel of riding, just make sure you consider your abilities and the terrain. Check out our full Hong Kong & Vietnam Trip Itinerary. Or our full South East Asia Trip Itinerary.